When it comes time to have maintenance or repairs performed on your Italian sports car, you want to call in renowned experts. At Lamborghini Montréal, the unrivalled expertise of our technicians allows us to handle your Lamborghini’s maintenance with care and efficiency, at any stage of your vehicle’s life. For the engine modification of a Lamborghini Aventador or Lamborghini Huracán; for the installation of high-performance Pirelli tires; for the recommended maintenance of your vehicle or any other mechanical need, rely on the experience of true connoisseurs. We will be able to retain or improve your Lamborghini’s performance and maintain its mechanical health for many years. For Lamborghini turbo and tuning, power lovers will find the complete range of Lamborghini high-performance parts and accessories at our dealership on the West Island. Our products are recognized worldwide for their exemplary design quality and unmatched precision fit, and contribute to deliver solid performance that meet your requirements. For a more aggressive look and to create more power, opt for the customization of your Lamborghini performed using a unique combination of Lamborghini parts and accessories designed for racing. Contact our experts today at 1 877 901-9762 to order a Lamborghini genuine part or accessory. Our upscale automotive services would be incomplete without an expertise in Lamborghini body repairs adapted entirely to your needs as well as to the strict standards of the Italian manufacturer. That’s why we have at your disposal, a specialized shop for the repair, restoration and reconstruction of Lamborghini’s unibody frames made of carbon fibres and aluminum. The new frames made of 100% carbon-fibre composites guarantee enhanced lightness and stiffness, as well as unequalled torsional strength. However, all repairs of the passenger compartment require unique know-how and specific technologies that only Lamborghini experts are able to provide. We therefore do not hesitate to send our technicians to the Automobili Lamborghini headquarters in Sant’Agata Bolognese, in northern Italy, so that they can continuously upgrade their skills. To obtain an estimate of your Lamborghini body works, make an appointment with our experts by calling 1 877 901-9762. Automobili Lamborghini is near you in moments of greatest need by providing roadside assistance services 24 hours a day 7 days a week in case of an accident or disabled vehicle, ensuring the expeditious and timely recovery of your vehicle. 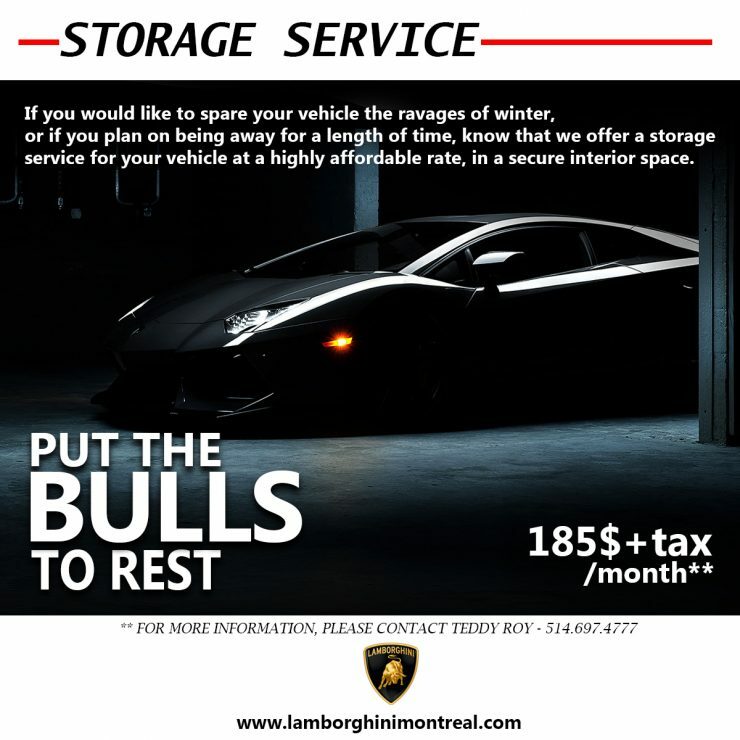 If you're looking for safe, secure vehicle storage in Montreal, John Scotti Automotive offers you a professional service to store your luxury car or SUV. Whether it's to keep your vehicle stored during winter or if you'll be away for an extended period, you can trust in our service to conserve your car's condition in full security, at a surprisingly affordable price. Our expert technicians know your car better than anyone else. To book an appointment with our service, simply fill out this form and specify the date and time you would prefer for your appointment. One of our team members will contact you to confirm shortly.